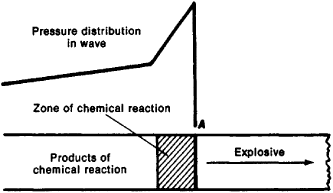 An exothermic chemical reaction that propagates with such rapidity that the rate of advance of the reaction zone into the unreacted material exceeds the velocity of sound in the unreacted material; that is, the advancing reaction zone is preceded by a shock wave. Spontaneous combustion of the compressed charge after passage of the spark in an internal combustion engine; it is accompanied by knock. a process of chemical transformation of an explosive that is accompanied by liberation of energy and that propagates through the substance as waves from one layer to another with supersonic speed. The chemical reaction is introduced by an intense shock wave, which forms the leading front of the detonation wave. Because of the sharp rise in temperature and pressure behind the front of the shock wave, the chemical transformation takes place extremely rapidly in the very narrow layer immediately adjacent to the wave front (see Figure 1). Figure 1. Diagram of a detonation wave: (A) shock wave front. The arrow shows the direction of propagation of the wave. The energy liberated in the zone of chemical reaction continuously maintains a high pressure in the shock wave. Thus, detonation is a self-supporting process. The excitation of detonation is the usual means of producing explosions. In an explosive charge, detonation creates an intense mechanical or thermal action (shock, spark discharge, or explosion of a metal wire by an electric current). The force of the action required to cause detonation depends on the chemical nature of the explosive. Substances sensitive to mechanical action include the so-called detonating powders (mercury fulminate and lead azide); they are usually a component of fulminating detonators, which are used to excite detonation of secondary (less sensitive) explosives. In a homogeneous explosive, detonation usually propagates at a constant velocity, which is the minimum possible rate of propagation for a detonation wave in the given substance. In a detonation wave that is propagating with minimum velocity, the chemical reaction zone shifts with the speed of sound relative to the reaction products (but at super-sonic velocity with respect to the initial material). Because of this, rarefaction waves, which form upon the expansion of the products of the chemical reaction, cannot penetrate the reaction zone and weaken the shock wave that precedes it. A detonation corresponding to the above conditions is called a Chapman-Jouget process. The minimum rate of propagation that corresponds to the process is used as a characteristic of the explosive (see Table 1). The pressure created during the propagation of a detonation wave in a gaseous explosive is dozens of atmospheres; in liquid and solid explosives it is measured in hundreds of thousands of atmospheres. Under certain conditions it is possible to excite in an explosive a detonation whose rate of propagation exceeds the minimum. The explosion of a solid charge placed in an explosive gaseous mixture produces a shock wave whose intensity is several times greater than the intensity of the wave corresponding to conditions of minimum velocity. This leads to the propagation in the gas mixture of a detonation wave of higher velocity. In this wave, unlike the Chapman-Jouget process, the chemical reaction zone moves at subsonic speed relative to the products of the reaction. Therefore, as a shock wave moves away from its place of formation, it weakens gradually (the effect of rarefaction waves is manifested), and the rate of propagation of the detonation is reduced to the minimum. A detonation wave of higher velocity may also be produced in a nonhomogeneous explosive when the wave moves in the direction of decreasing density. A spherical detonation wave converging on a center may be taken as a further example of propagation of detonation with a velocity exceeding the minumum value. As the wave approaches the center, its velocity increases. At the center such a wave for a short time creates a pressure that exceeds by several times the value characteristic of the Chapman-Jouget state. A stable detonation process is not always possible. For example, a stable detonation wave cannot propagate in a cylindrical explosive charge of insufficient diameter (scattering of the explosive through the side surface causes cessation of the chemical reaction before the substance has had time to react appreciably). The minimum diameter of the charge in which a nondecaying detonation process is possible is proportional to the width of the chemical reaction zone. In gaseous explosive mixtures, propagation of detonation can occur only under conditions such that the concentration of combustible gas (or vapors of combustible liquid) lies within certain limits. These limits depend on the chemical nature of the explosive mixture, the pressure, and the temperature. For example, with a hydrogen-oxygen mixture at room temperature and atmospheric pressure, the detonation wave can propagate if the volume concentration of hydrogen is between 20 and 90 percent. The study of detonation waves in gases shows that if the initial pressure is lowered, the chemical reaction becomes pulsating in character. The uneven progress of the reaction causes distortion of the shock wave that is moving forward. Finally, at sufficiently low pressure, so-called spin detonation is caused, in which a break forms at the front of the detonation wave and rotates along a helical line. Further reduction of pressure causes extinction of the detonation. In addition to detonation, another kind of chemical reaction wave, combustion, is possible in an explosive. Combustion waves always propagate with subsonic speed (usually considerably less than the speed of sound in the initial material). The motion of a combustion wave is conditioned by the comparatively slow processes of thermal conduction and dif-fusion. Under certain conditions combustion can become detonation. In many cases, such as the combustion of a fuel mixture in internal-combustion or jet engines or of powder in the body of an artillery piece, detonation cannot be permitted. Because of this, combustion conditions and the chemical composition of the materials used are chosen in such a way that detonation, with its characteristic very sharp rise in pressure, cannot occur. Zel’dovich, la. B., and A. S. Kompaneets. Teoriia detonatsii. Moscow, 1955. Shchelkin, K. I., and la. K. Troshin. Gazodinamika goreniia. Moscow, 1963. Kompaneets, A. S. Udarnye volny. Moscow, 1963. 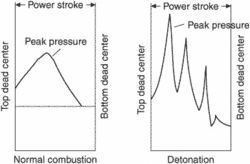 Engine cylinder pressure in normal combustion and in detonation. Differences in development of peak pressure values in both cases may be noted. An explosion. A spontaneous, or exceedingly rapid, combustion of a fuel-air mixture after normal ignition inside the combustion chamber at a temperature and pressure critical to a particular type of gasoline, causing an explosion. The explosion is the result of a high-speed heat wave passing through the charge. Detonation occurs if the burning rate of the fuel is not compatible with the compression ratio and the spark plug advance. The most common indication of detonation is a high cylinder-head temperature. Throttle reduction is the most immediate and surest remedy. Table-3: The average molar volume (V), heats of formation at 298K (Df H0 298) theoretical densities (r) the detonation velocity (D) and pressure (P) of MNPP, CNPP and DNPP. Identifying detonation in a conventional aircraft piston engine from the cockpit is virtually impossible without closely monitoring cylinder heat temperatures (CHTs). The explosive is calculated with Eulerian Algorithm and depicted with MAT_ELASTIC_PLASTIC_HYDEO material model and PROPELLANT_DETONATION equation of state; the air is also calculated with Eulerian Algorithm but depicted with NULL material model and LINEAR-POLYNOMIAL equation of state; the detonation powerplant is calculated with Lagrange Algorithm and depicted with RIGID material model [8-10]. Such an emulsion after entering the special materials--sensitizers--provides high detonation parameters and sensitivity to detonator cap. The RDE concept for a detonation combustor consists of a concentric circular-tube annulus, where a premixed fuel/air mixture is injected axially at the annulus entrance. The participants organized a blood detonation campaign, and paid visits to the injured members of the Syrian Arab Army in al-Mukharram area. The Indian troops on patrol opened fire, which apparently led to the detonation of the explosive device allegedly being carried by the terrorist. It is the FIRST solution that can automatically retrieve any file on any system and submit it to FireEye for detonation and, if it's determined to be malicious, prevent it from ever executing again. Detonation nanodiamond particles (DND) are 2- to 10-nm diamond nanoparticles produced by the detonation of 2,4,6-trinitrotoluene (TNT) / 1,3,5-trinitro-triazacyclohexane (hexogen) explosives in a closed steel chamber, with either a gaseous C[O. It is Mian Nawaz Sharif who earned respect in the hearts of the nation thanks to atomic detonation of Chagai," he said. Security expert Tom Clonan said although the ability of the communist regime to strike its enemies is unclear, any nuclear detonation could lead to disaster. In the second phase, this may include the controlled detonation of another triggering mechanism.